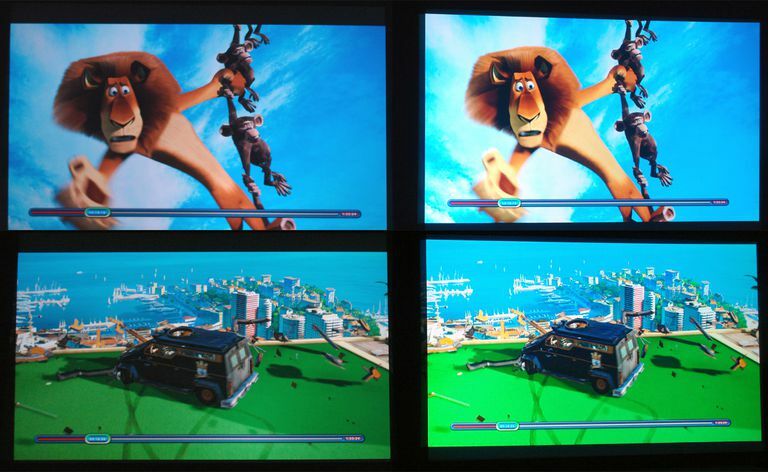 Video projector color brightness comparison - DLP vs LCD. When considering a video projector, probably the most obvious specification that you become aware of is the lumens number. Lumens is a measure of how much light a video projector can output. However, just as with other specifications, when a lumens number is provided ("hyped"), you have to cautious, as there is no official standard that is required to be used. A stated Lumens rating used by one projector brand may not be the same as another brand. On the other hand, if the lumens rating is stated in terms of ANSI lumens, that is an industry standard that is consistent if comparing two brands and both are using ANSI as their reference. However, there is more to consider in terms of how much light a video projector can output. When a single lumens rating is stated, what it is referencing is how much White Light Output (WLO) or White Brightness, the projector is capable of producing, not the total light output when color is taken into consideration. For example, two projectors can have the same WLO rating, but the color light output (CLO), or Color Brightness, may be different. To illustrate the difference between White and Color Brightness, the above photo shows a side-by-side demonstration of the effect of color on video projector lumens, or light, output. Both projectors in the photo have the same White light output capability but differ in the amount of Color brightness that is present. The reason that there is a difference in the Color Brightness of the two projectors is that the projector on the left side uses a 1-chip DLP design (Optoma GT750E), while the projector on the right used a 3LCD design (Epson PowerLite Home Cinema 750HD). Both projectors have the same native display resolution (720p) and the same ANSI lumens WLO specification: 3,000. The stated contrast ratio for the Optoma is 3,000:1 and for the Epson is stated as "up to" 5,000:1. However, the projector on the right appears to have brighter, more vibrant colors, as well as overall brightness, than the projector on the left. A projector with a 3LCD design allows all of the white and color light to pass through the lens continuously, resulting in an equal amount of perceived White and Color Brightness. However, in a 1-Chip DLP design, light has to travel through a spinning color wheel that is divided into red, green, and blue segments. With projectors that use the 1-chip DLP system, colors are projected sequentially (in other words, your eye is not receiving color information continuously), which can result in much lower color light output, in relation to the white light output. To compensate for this, 1-chip DLP projectors often add a white segment to the color wheel in order to boost While Brightness, but the fact remains that the degree of Color Brightness is less than the White Brightness. This difference is usually not stated by the manufacturer in their projector specifications. What you most often see is a single Lumens output specification, rather can one that lists two lumens specifications, one for WLO (White Light Output) and one for CLO (Color Light Output), which provides a more accurate profile of how much Color Brightness you can perceive. On the other hand, 3LCD Projectors employ a mirror/prism assembly (no moving color wheel) in combination with a separate chip for each primary color (red, green, blue), so both white and color continuously reach your eye. This results in consistent White and Color Brightness. As a direct result of the different technologies used, in order for the 1-chip DLP projector on the left to produce as much Color Brightness as the 3LCD projector on the right, it needs to have a much higher White Light Output capability. This means a 1-chip DLP projector would have to use a higher-wattage lamp and the resultant increase of power consumption. Referencing the photos shown, Color Brightness has a direct effect on what you see on the screen. This can be important not only for typical home theater viewing but for viewing in rooms where the presence of ambient light may not able to be easily controlled, 3D viewing ( where brightness loss when viewing through 3D glasses is a factor), and for those that use video projectors in educational or business settings, where light conditions are not known beforehand. Increased color brightness also increases the perception of details within the image, regardless of the display resolution. The only factor that can suffer when color brightness is increased is the overall contrast level. However, there are other video processing factors that can affect this result. For more details on the Color Brightness Standard, refer to the Official Announcement and the Color Brightness Standard White Paper. Also, to compare Color Brightness specifications for select video projectors, check out the Color Light Output Projector Comparison Page.